PHOTO: The Remarkable Mountains set a backdrop to Lake Wakatipu from the patio of the Owner’s House at Matakauri Lodge. Guests at Matakauri Lodge can now look out over Lake Wakatipu from the new four-bedroom “Owner’s Cottage.” The 5,000-square-foot suite opens as the highest tier of accommodation at the Queenstown, New Zealand luxury lodge. The $5 million suite can host up to eight people in a four-bedroom reservation. It’s also available in a two-bedroom format. The Owner’s Cottage operates separately from the rest of the property, creating the feel of a separate home, a quality that works well for families or groups of gathering friends. There are six separate outdoor spaces, including a courtyard and Jacuzzi, supplemented by a full kitchen where guests may cook for themselves or employ a lodge chef. 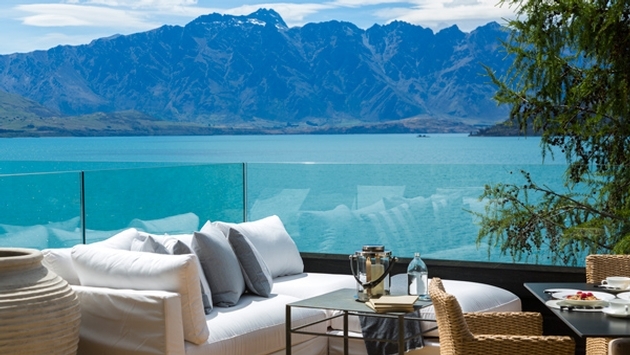 Each suite has a private balcony and floor-to-ceiling views of the aptly named Remarkable Mountains on Lake Wakatipu. Nightly rates range from $5,000 for a two-bedroom suite to $12,000 per night for the four-bedroom house and include: full breakfast, pre-dinner drinks and canapés, dinner, complimentary in-suite refreshments and bar, Wi-Fi and use of lodge facilities (excluding spa treatments). Pune will be the home of India’s first Conrad Hotel after Hilton Worldwide signed a management agreement with Palm Grove Beach Hotels Pvt. Ltd. In June. The Conrad Pune will open next year in Maharashtra State’s second city. The hotel will be located on Pune’s Mangaldas Road within the central business district, minutes from the commercial and entertainment hubs in Kalyani Nagar, prime government institutions in Yerwada and the residential neighborhoods of Koregaon Park and Bund Garden. The 310-room hotel’s Art Deco flair is characterized by geometric shapes, dashes of striking color and hints of lavish ornamentation. The hotel will feature six dining outlets, an outdoor pool, a fitness center, a full-service spa and a salon. In India, Hilton Worldwide currently operates the Hilton Garden Inn New Delhi/Saket; Gurgaon: Hilton Garden Inn Gurgaon Baani Square and DoubleTree by Hilton Gurgaon-New Delhi NCR; Mumbai: Hilton Mumbai International Airport; Chennai: Hilton Chennai; Bangalore: DoubleTree Suites by Hilton Bangalore; Trivandrum: Hilton Garden Inn Trivandrum; Vadodara: Hampton by Hilton Vadodara-Alkapuri; Pune: DoubleTree by Hilton Pune-Chinchwad; Goa: DoubleTree by Hilton Goa-Arpora-Baga and Shillim: Hilton Shillim Estate Retreat & Spa. Bumi Duadari, the private retreat of Indonesian designer and art collector Hendra Hadiprana, has been opened up exclusively to guests of GHM’s Chedi Club Tanah Gajah. Located in the Balinese artistic enclave of Ubud, the hotel will use the retreat as a setting for weddings or renewals of vows. The main home features abundant natural light with towering windows leading to thatched wooden ceilings. Colossal stone sculptures depicting women and angels can be found throughout the expansive grounds. Ceremonies and receptions can be held for as many as 40 people within the gardens, by the pool, or at the pavilion overlooking the estate. A Balinese-style marquee will be used for cocktail and canapé receptions. For smaller wedding parties of 20 people or less, there is the option of a private hilltop barbecue dinner with sweeping views of the property. Shangri-La International Hotel Management will open its second hotel, the Lakeside Shangri-La Yangon, in 2017. With a prime location on the banks of Kandawgyi Lake, the 350-room property will command sweeping views of Shwedagon Pagoda and the lake. The hotel will open near the Shangri-La Residences Yangon which are managed by the same group. The Lakeside Shangri-La Yangon will have three restaurants, two bars, extensive meeting and convention space, a health club, and an outdoor swimming pool. Guests will also have easy access to Kandawgyi Nature Park and the Yangon Zoological Gardens surrounding the lake. The Equatorial Cameron Highlands has been rebranded as the Copthorne Hotel Cameron Highlands. The Tudor-style resort is spread over 13 acres in the Cameron Highlands and features 141 self-contained low rise apartment suites and 268 superior rooms. Situated 1,628 meters above sea level, the Copthorne Hotel Cameron Highlands is at the highest accessible point in the highlands region, giving all of its rooms views of one of Malaysia’s most scenic regions. Resort-wide facilities include Wi-Fi, extensive meeting rooms including an expansive ballroom, indoor heated pool, fitness center, bar, and a restaurant serving global cuisines. The hotel is ideally positioned to take advantage of nearby leisure attractions including trips to the Orang Asli settlement for guests interested in learning about the indigenous people of Malaysia and close proximity to Brinchang and Tanah Rata hillside towns.